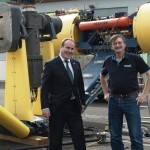 The world’s most powerful tidal turbine, which is due to begin testing in Orkney, has been hailed as a potential “game changer” by Business, Innovation and Energy Minister Paul Wheelhouse. At 63m in length, Scotrenewables’ SR2000 is longer than Edinburgh’s Scott Monument and is capable of generating 2MW of power – enough to meet the needs of approximately 1,000 homes over the course of a year. 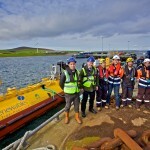 Mr Wheelhouse visited Hatston pier where the unit is undergoing final commissioning checks in advance of being connected to its mooring system on the European Marine Energy Centre’s (EMEC) test site in Orkney. 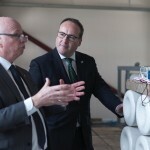 “Scotland’s capacity to generate tidal power is considerable and this device has the potential to be a real game changer for the industry, not only here in Scotland, but across the world. “Floating technology like this is likely to be easy and cheap to install, maintain and decommission. This will increase the commercial viability of tidal energy, which is crucial as we continue to transition towards a low carbon economy. 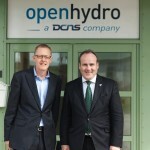 The project has been supported by Scottish Enterprise’s WATERS II scheme along with investments from Scotrenewables’ shareholders which include ABB, DP Energy, Fred. Olsen, Total and Scottish Government via the Renewable Energy Investment Fund (REIF).